Brown, J., Cline, N., & Méndez-Brady, M. (2020, forthcoming). Leaning on our Labor: Whiteness and Hierarchies of Power in LIS Work. Who’s Afraid of Race? Critical Race Theory (CRT) in Library & Information Science/Studies (LIS). MIT Press. In Progress. Brown, J., Ferretti, J., Leung, S., Méndez-Brady, M. (2018, September). We Here: Community Building as Self Care. Presented at the 3rd National Joint Conference for Librarians of Color, Albuquerque, NM. Méndez-Brady, M., Bonnet, J., Gomis, M. (2018, June). Transforming Ourselves from the Inside Out: Peer Coaching for Professional Development. Presented at the American Library Association Annual Conference, New Orleans, LA. Gill, J., Méndez-Brady, M. (2017, April). Social Media for Outreach, Networking and Collaboration in Science and Research. Presented at the Women in Science, Technology, Engineering, Math, and Medicine (WiSTEMM) Symposium, University of Maine, Orono ME. Méndez-Brady, M. (2016, December). Scholarly Publications in the Digital Landscape: Maximizing the Reach and Impact of Your Work. Invited speaker for the School of Biology & Ecology, Fall 2016 Seminar Series at the University of Maine, Orono, ME. 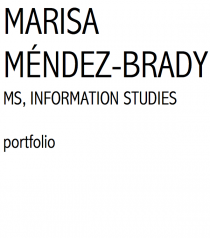 Méndez-Brady, M. (2016, November). Design on a Dime: Creating Effective Presentations: Two Part Workshop. Presented at the meeting of the Maine Library Association, Sunday River, ME.